An international tribunal in the Hague ruled in favor of the Philippines Tuesday, concluding that there was no legal basis for China to claim historic rights to resources within South China Sea areas falling within the "nine-dash line." Beijing asserts sweeping ownership over the ocean areas, and the Paracels and the Spratlys - two island chains claimed in whole or in part by a number of countries. Here’s a comprehensive guide about the issue. In anticipation of a verdict to be delivered by the International Tribunal of the Permanent Court of Arbitration in The Hague on Tuesday, China has orchestrated a worldwide campaign to defuse its findings. The case revolves around the Philippines objections to Chinese maritime territorial claims in the South China Sea. The fact that China has resorted to everything from newspaper advertisements and op-eds to academic attacks to diplomatic offensives is evidence of deep unease that China will not fare well in the findings. China has been throwing around words like "farce" and calling the decision "illegal, null and void from the outset". The argument pushed hardest by China is that the tribunal has no jurisdiction and that its verdict is non-binding. Within this is an objection that the consent of both parties is required for compulsory arbitration. David Tweed, a Hong Kong-based Bloomberg reporter, exposed this fallacy in a series of tweets: "Here is the 4-point legal reality: (1) People's Republic of China is a party to UNCLOS (The United Nations Convention on the Law of the Sea), (2) PRC is a party to the case brought by PH (the Philippines), (3) UNCLOSArt 288: If there is a dispute whether tribunal has jurisdiction, it shall be settled by tribunal, (4) UNCLOSArt 296: Any decision by tribunal "shall be final and shall be complied with" by all the parties." As a voluntary signatory to the United Nations Convention on the Law of the Sea, China is obligated to comply with its regulations. Its claim of "invalidity" is clearly wrong. Julian Ku, the Maurice A Deane distinguished professor of constitutional law at the Hofstra University School of Law, noted, "Because the tribunal has exercised its powers under Article 288(4) to determine that it has jurisdiction over the dispute, then China is bound whether or not it has consented to this particular arbitration." Accusing the court of bias, even being "an agent of the Philippines", has been another Chinese tactic. It is true the then tribunal president Shunji Yanai, a Japanese national, helped choose the judges. However, this only occurred because Beijing refused to participate in the case and therefore forfeited its legal right to appoint panel members. Another odd argument from China is that the country is "upholding and safeguarding the international rule of law" by boycotting the arbitration process. Rather, most would argue the greater damage to the international rules-based system is China's foregone decision of "non-acceptance and non-participation". 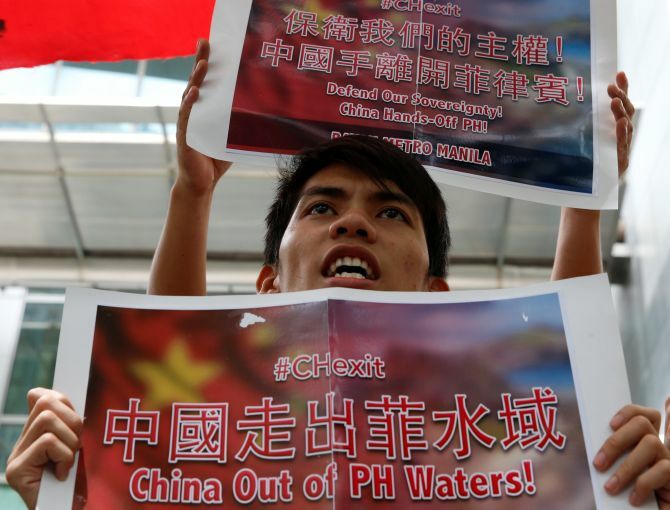 One example of China's publicity campaign against the PCA and the Philippines was an op-ed entitled 'Debunking 10 myths about China and the South China Sea' that appeared in the South China Morning Post, a Hong Kong daily newspaper, on 10 July. It was an edited translation of a speech given by Wang Wen, executive dean of the Chongyang Institute for Financial Studies at Renmin University of China. Wang listed 10 myths surrounding the South China Sea. It is worth examining them to assess the degree of obfuscation to which China is resorting. As discussed above, Beijing is well within its rights not to participate in the PCA process. This is not really a myth, because this is well recognised. However, China turned it around completely and instead accuses the Philippines of violating international law because it broke a commitment made in the 2002 Declaration on the Conduct of Parties in the South China Sea (signed between China and ASEAN) that disputes should be resolved through friendly negotiations. The Philippines attempted for 17 years to negotiate with China without success, and it argues the Declaration on Conduct is a non-binding political document without legal obligations. In handing down the extent of its legal jurisdiction last October, the PCA explicitly agreed with the Philippines by saying the declaration does not preclude parties from seeking third-party arbitration. Considering that China has itself flaunted the Declaration on Conduct in terms of not exercising "self-restraint in the conduct of activities that would complicate or escalate dispute and affect peace and stability", Beijing's argument is on thin ice. It is ironic that China denies the relevance of one law in favor of a much lesser declaration. China upholds an ambiguous "nine-dash line" claim over the South China Sea -- first marked on Chinese maps in 1947. Admiral Sun Jianguo of the People's Liberation Army Navy shared at the Shangri-La Dialogue in May, "All of us believe that the South China Sea has been Chinese territory since ancient times. 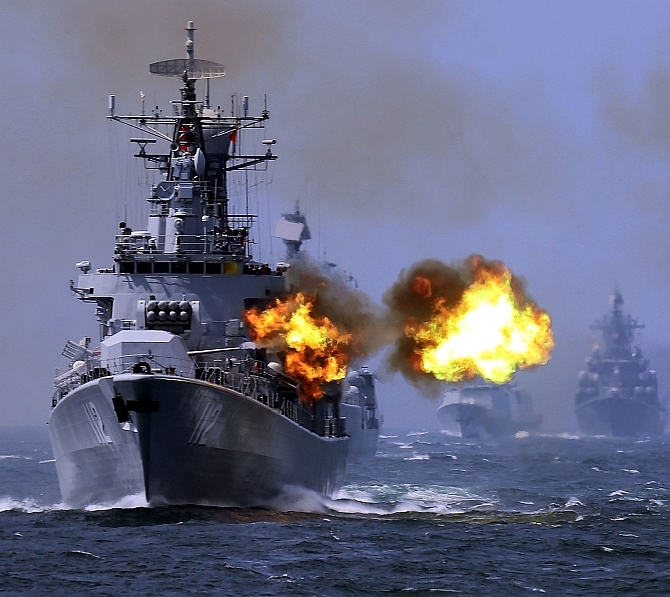 What is happening now in the South China Sea hurts the heart of every Chinese." 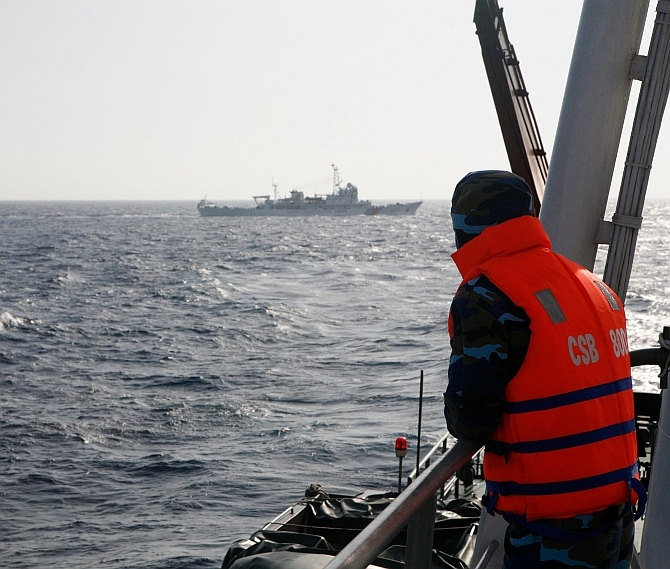 China argues UNCLOS does not exclude historical rights that predate it. In a sense, Wang is correct because the PCA cannot deliver any verdict on sovereignty. It will rule on seven of 15 submissions raised by the Philippines, plus it has reserved the determination of jurisdiction over another seven to the merit phase. In light of this, the more pertinent question then is whether Chinese "historic rights" within this dashed line exceed the limits of potential entitlements under UNCLOS. This is indeed the basis of Manila's submission. Bill Hayton, a BBC reporter and author of 'South China Sea: The Struggle for Power in Asia', argues persuasively that much of China's historical claims are non-existent or exaggerated. He stated, "There is no archaeological evidence that the earliest users of the Spratly and Paracel islands owed any allegiance to any state around the coast of the South China Sea." Amusing is a BBC investigation by John Sudworth, who travelled to Hainan Island to unearth a 600-year-old book supposedly detailing how Chinese fishermen navigated to the far-flung Spratly Islands. Offered as "iron-clad proof" by the authorities of China's historic claims, as it turned out, the owner said, "Although the book was important, I threw it away because it was broken." Hayton suggested, "The way towards a peaceful resolution of the disputes in the region is to recognize that, throughout its history, the South China Sea has been a shared sea, never owned by any one power. That is how it should remain." Captain Tuan N Pham, a US Navy officer writing in The Diplomat, emphatically added, "There is no legal basis for an historical rights claim to an EEZ [exclusive economic zone]." Wang is technically correct, for China does not claim all of the South China Sea. Instead, its strategically vague nine-dash line encloses some 90 per cent of the 3.5-million-square-kilometre area. Beijing continuously resorts to assertions of "indisputable sovereignty", despite this sovereignty being very much in dispute. Notably, the PCA tribunal does not have jurisdiction to determine sovereignty over geographic features. Its mandate is limited to interpretation and application of UNCLOS, which governs maritime areas only. It will not determine who owns land features or where correct maritime boundaries should be drawn. M Taylor Fravel, an associate professor of political science at the Massachusetts Institute of Technology, confirmed, "It cannot rule on the most fundamental issue -- the sovereignty over the islands, rocks and reefs that make up the contested Spratly Islands." Thus, the chief underlying issue behind regional maritime tensions -- who owns what -- will not be sorted out by the PCA. In the South China Sea, there are competing and overlapping territorial claims from Brunei, China, Malaysia, the Philippines, Taiwan and Vietnam, but this issue will remain unresolved. Fravel continued, "The tribunal's award will avoid any question of maritime delimitation or boundaries. The reason is procedural: under Article 298, the treaty allows states to exclude maritime boundary delimitations from the convention's compulsory dispute resolution." China did precisely that in 2006. The International Court of Justice can adjudicate on "sovereignty" disputes, but only if both parties consent. There is no chance of this coming from China. The fact remains, as Pham wrote, "Beijing tries to reinterpret these provisions by claiming unwarranted maritime zones through excessive strait baselines, unlawful archipelagic baselines and vague rights based on historical waters. To sum up, China ultimately seeks to separate swaths of ocean for its exclusive economic development and create de facto demilitarized zones in the middle of the SCS for military purposes." It is true that the sea's incredibly busy shipping lanes are unimpeded, as are the majority of flights. Nevertheless, military overflights are routinely challenged by military radio operators, and foreign warships can be shadowed. Last year the USA conducted freedom of navigation operations (FONOP) in the waters of 13 countries all around the world. Yet Beijing vociferously opposes such FONOPs, and accuses the USA of hyping up tensions. Ironically, the PLAN sailed warships through contiguous waters nears Japan's Kita-Daito Island on 16 June. Rebutting Japanese complaints, the Chinese Ministry of National Defense said, "It is completely in accordance with relevant principles of the international law for Chinese warships to sail through Japan's adjacent waters during normal navigation." It added, ".We really can't understand why Japan has repeatedly hyped up Chinese warships' legitimate activities recently."Contradictory? 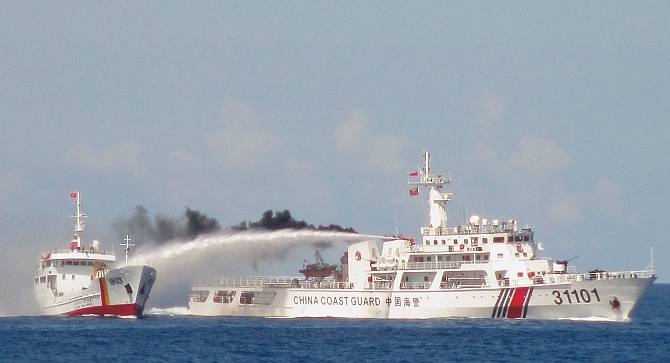 IMAGE: A Chinese coast guard ship (right) uses a water cannon on a Vietnamese naval vessel near the disputed Paracel Islands in the South China Sea on May 3. In actual fact, Beijing has already changed the status quo. It is true that other claimants occupy islands and reefs and have military facilities in the South China Sea. However, none approach the speed and scale of Chinese militarisation. A 2015 Pentagon report assessed, "China has now reclaimed 17 times more land in 20 months than the other claimants combined over the past 40 years, accounting for approximately 95 per cent of all reclaimed land in the Spratly Islands." At the Shangri-La Dialogue in Singapore, US Defense Secretary Carter warned that China's actions are "are isolating it, at a time when the entire region is coming together and networking. Unfortunately, if these actions continue, China could end up erecting a Great Wall of self-isolation". Beijing claims its construction activities are on "natural features" and they are thus fundamentally different to "artificial islands, installations and structures" as listed in UNCLOS. China has reclaimed land at eight reefs in the Spratly Islands -- Cuarteron, Eldad, Fiery Cross, Gaven, Hughes, Johnston South, Mischief and Subi. Significantly, the first ever Spratly runway, at Fiery Cross Reef located 1,000+km from China's coast, was inaugurated in January. It will certainly be interesting to see what the PCA decrees. By creating permanent features, China hopes to establish islands fait accompli. Although no decision will be made over sovereignty, it has to be ascertained first of all whether disputed geographic features are islands or not. China insists that everyone accept that its sovereignty over the Spratly and Paracel islands has a full historical and legal basis, i.e. that it owns the entire area and not just individual islands. Article 121 in UNCLOS defines an island as naturally formed land above water at high tide. It must also be able to sustain human habitation or economic life to be so classified as an island rather than a rock. This is vitally important because islands are entitled to both 12 nautical mile territorial seas and a 200nm EEZ; rocks can only have the former. Simply building up a submerged feature or low tide elevation does not legally turn it into an island, however, under international law. Calling Western accusations of Chinese militarisation as "groundless", Wang failed to mention the installation of radars, runways suitable for all categories of military aircraft, harbor facilities, deployments of fighters and the siting of surface-to-air missiles and likely anti-ship missiles on its islands. In the week before the court's verdict, the PLAN performed its largest ever exercise in the sea involving nearly 100 ships and multiple aircraft. China has used the excuse of US FONOPs as justification for building up military installations. To expose the falsehood of such notions, the Pacific Command of the US military even surprisingly tweeted, "You have to hand it to China. They can analyze a situation that they actually created and turn it completely around and play the victim." Wang's claim that "constructions in the South China Sea are mainly for civilian purposes" is patently untrue. For example, Woody Island in the Paracel chain is an overcrowded outpost where military personnel outnumber civilians three to one. Apart from appeals to great care being taken for ecological preservation, China has an extremely poor environmental record. Alan Freidlander, a biologist at the University of Hawaii, told journalists in May 2015, "The Spratlys alone are home to 571 coral species and a huge variety of fish. But the dredging and building on coral reefs in the South China Sea is causing irreparable damage to one of the most diverse ecosystems on earth." Wang excuses Chinese activities in the South China Sea as being "necessary to protect its legitimate interests, and are justified reactions to provocations by other claimant states". Pointing the finger at "collusion between the US and regional claimant states", China deflects any responsibility for heightened tensions. Indeed, if it is to be believed, the US, its cronies and the Western media are entirely to blame for the situation. Dai Bingguo, a former leading foreign affairs diplomat under Hu Jintao, said in a recent Washington DC conference that "no country should implement the award in any form, much less force China into implementation". Of course, the problem is that the PCAhas no ability to enforce its decisions anyway. Fravel, concluded, "How China will actually respond to the tribunal's award, of course, is uncertain. Apart from continued public diplomatic efforts to delegitimize the tribunal, whether China takes bold action on the waters of the South China Sea is likely to depend on the content of the award and how other stakeholders respond themselves, especially the Philippines and the US." Meanwhile, referring to China's publicity campaign, Julian Ku on the Lawfare website concluded, "While I do not condemn China for refusing to participate in the arbitration, I do condemn its not-so-subtle attempts to smear an arbitral process which it had every opportunity to participate in. China has not been treated unfairly by the UNCLOS arbitration process, and informed observers should not let China get away with claiming otherwise." Befriending the US while tempering China: Can India do it?